Now I must admit that even when I was with Translink – many years ago now – I was not required to do much about the Major Road Network (MRN). It exists because the province was going to download some provincial highways and bridges to the municipalities anyway. So if they all joined up into Translink they would have access to some of the new funding that was to come with the new authority. The only exception was the City of Vancouver which did not have any provincial highways within it to be downloaded. Fortunately one of the strongest proponents of the new authority was Councillor George Puil, and he came up with the formula that persuaded Vancouver that being part of the MRN would be a Good Idea. Some roads within Vancouver are now identified as part of the regional MRN. You can refer to Translink’s web site for more information (and a map) which also includes the rather odd list of bridges, one they built themselves – partly paid for by tolls – to replace the free Albion Ferry, two important links that cross municipal boundaries and one bizarre little ancient wooden swing bridge wholly inside Delta. Oddly the Annacis Swing Bridge which connects Delta’s Annacis Island to New Westminster – and also carries the Southern Railway of BC – remains with the province even though the road it carries is not a provincial highway either. Basically the Knight St and Patullo Bridges were overdue for expensive upgrades so the province was eager to get rid of them. Translink committed to spend $45m on the MRN this year – which out of a total spending of ~$1.4b is not a very large amount. Translink does not itself have any operational involvement – all of that spending is passed through the municipalities and nearly always on jointly funded projects. The MRN is actually run by a committee made up of the Chief Engineers of each of the municipalities, with Translink providing administrative support. Day to day management and operations remain with the municipalities. For cities like Vancouver and New Westminster there is no real interest, or opportunity, for major capacity expansions. The cities are built out and land acquisition costs are huge. And as Seattle is learning (and Boston learnt) tunnelling for additional freeway capacity is not only expensive but very risky. The only real stumbling block has been the lack of willingness to give up road space to more efficient modes. There are no busways here – and very few dedicated separate cycling facilities. No one has ever seriously considered here what the French call “the art of insertion” (link to presentation) to devote more of the space between building frontages of a street to wider sidewalks, tram tracks or dedicated exclusive bus lanes. It must also be noticed that municipalities themselves do not spend very much on new road building. A lot of new roads get added to the network every year, and “improvements” are made to the existing roads, by developers – or by cities thanks to development cost charges. Many major developments are made conditional upon increases to local network capacity. No-one, so far as I am aware, ever does any examination of the combined network effects of these developments. The big spender on roads in the region is the province. While other jurisdictions have cut back on road spending to free up funds for more efficient and environmentally friendly public transport, BC continues throw billions at freeways and other major highway expenditures. It has never suggested that any of these projects be subject to dedicated funding – or referenda of local populations. It is merely continuing with business as usual – blacktop politics has long dominated the BC agenda. In part this is due to the fact that BC only has one major urban metropolis. The Ministry of Transportation is in reality the Ministry of Highways since no other mode grabs the attention of the provincial politicians in quite the same way. BC Ferries, of course, being a whole ‘nother topic best left for another day. The reasons the province gives for its obsession with road construction is always framed in the context of jobs and the economy. It is always referred to as an “investment” which sounds so much less profligate than “spending”. In urban areas like the Lower Mainland it has also been tied to the port – the “Gateway” – even though the vast majority of the import and export tonnage moved through the Port of Vancouver moves inland by railway – and probably increasingly by pipeline in the future. In reality, the major growth in traffic on these new roads is single occupant cars and trucks used as cars. Traffic in urban areas expands and contracts to fill the space available – and this induced traffic is seen long before land use changes add their contribution to congestion. Which in any event is not an all day or everyday phenomenon. Most roads, much of the time, have spare capacity. Like the parking lots, they are overbuilt to meet the peak need and the rest of the time are underutilised. It was ever thus. It is very significant I think that only two new major bridges have been funded by tolls in recent years – and in both cases revenues have been below forecast. Gordon Campbell early on decided to court popularity by cancelling the tolls on the Coquihalla Highway and no-one has ever seriously suggested tolling elsewhere, though a P3 on the Sea to Sky uses “shadow tolls” to calculate payments to the contractor. User pay is a prerequisite for transit – and ferries. On highways and bridges, not so much. I got an email this morning from Car2Go apologising for a disruption in service last night. It was a significant event. Yesterday, at 4:30pm CST, our car2go vehicles experienced a disruption in service that was directly related to our Germany-based mobile provider. At that time, our provider had undergone a malfunction within their network that disabled cell phone roaming, resulting in a break in remote connection with all of our car2go vehicles across North America and their network in Germany. Thus, members were not able begin or end their trips until the issue was resolved at 12:54am CST today. The letter goes on to explain further and detail what car2go corporately had done at the time and would be doing in future. This incident did not get reported on the CBC Vancouver TV evening news. In fact until I got the email from car2go I was unaware that there had been any problem. What we did see last night was the disruption in the UK due to a computer issue with air traffic control – also a non-trivial impact – and a rehashing of the potential “news story of the year” – Skytrain and Compass problems at Translink. Conflated, you will note, but also problems of a similar nature to car2go and UK ATC. We have become dependent on computer systems and they are not 100% reliable all the time. When they do go wrong, it is not just inconvenient for a few, but many and for extended periods of time. And we look for someone to blame. CBC reran the video of Todd Stone comparing Translink to the private sector where, he said, “heads would roll” under similar circumstances. Again, no one pointed out that the problems with Compass are the responsibility of the private sector contractor, Cubic, who is failing to deliver what it contracted to provide. We seem determined to blame Translink for this failure (even though Faregates and all that followed result from a decision by Kevin Falcon): as though sacking Ian Jarvis would somehow compensate for that. He isn’t going to resign – though reporter Eric Rankin seemed seemed to be saying he should due to the SkyTrain problems. Actually he was misreporting since Stone was talking about Compass NOT Skytrain. But we will let that go. Now Bob Mackin is a “news, sports, business and politics journalist.” He poses a question – but in reality is implying that Translink is inefficient because a trolleybus is nearly empty. I declined to be drawn because the question betrays the ignorance of the questioner. Of course the trolley bus is going to empty some of the time, on some parts of its route. Unfortunately it is impractical to switch it for a smaller bus some of the time and for some of the route, because its capacity is going to be needed later somewhere else. It is the nature of transportation demand to be peaky. That’s why you can get deals on airlines for some flights on some days – they have a pricing system that allows them to optimise demand. We have not yet reached that level of sophistication with transit, and the technical problems of getting Compass to work with a much simpler (but still complex enough) fare system are a good enough illustration of why that might be. Anyway, the major cost of bus operation is the driver – and the mechanics who look after buses when they go out of service. Translink pays the operators of “minibuses” (community shuttles) a bit less but that was a concession hard won. It is impossible for any transit system to have the right sized bus on part of the route for different parts of the time. Just ask the kids who go to school on Community Shuttle routes. Unlike SkyTrain, where you can turn additional capacity on and off as long as there usable spare trains available, (and not of course on the Canada Line even if though there are) there is no back up of drivers and buses that can be summoned or dismissed easily and cheaply. But Bob Mackin is sure that if he was in charge or Translink, he could make it run better: or maybe he thinks that he could hire smarter people who could. Which was exactly why we had that long bus strike, and why most of us are glad that we seem to have avoided one since. Of course, for Translink critics, like Jordan Bateman, any public sector operation is by definition inefficient. Translink management gets no credit at all for running a pretty reliable service most of the time and avoiding strikes and other outages. Mistakes – such as accommodating demands for greater efficiency by not buying an expensive software package – will be noted as black marks, not rewarded as cost cutting. Most cost cutting leads to impacts elsewhere, as the Mayors elected in municipalities impacted by service rationalisation were eager to stress last Thursday. But how else does Translink get more service hours to increasing demand on overcrowded routes when there is no new funding? And isn’t this exactly the same problem writ large that Mackin identifies? Bob Mackin is also the reporter who chose to list the cost impact of increasing sales tax. It is sometimes hard to tell when reporters are actually trying to influence their readers, since there is always an editorial process that leaves other stuff out. It is the absence of other information that gives the story its slant. This does not have to be deliberate “spin” but we do expect that all media will at least attempt even handed reporting. This in itself can result in spin. The way that mainstream media has given so much prominence to climate change deniers, for example, when there is hardly any real scientific disagreement. See that video clip above for another example. I do not pretend to be a reporter. I am unabashedly an advocate. My preferences are clear. More transit is a better outcome for this region than more roads. Congestion is not even the major problem that I would chose to stress, though I see why the BoT would. Air we can breathe, water we can drink and food we can eat are not merely desirable, they are essential. Edible shellfish are currently denied us at our beaches. The weather is dreadful and the seas are rising. The place we get our food from has had a prolonged drought – and we have covered over our own food growing area to store containers. Most of which are empty. People are in general hard pressed financially. Not so much through taxation as its replacement by fees and charges and the unwillingness of many private sector employers to pay wage increases in order to increase profitability. I understand why this inevitably leads to opposition to tax increases, but things have to be paid for – and this current proposal is the least worst option. And as a value for money proposition is, I would argue, unbeatable. It would be preferable to live in a society that valued all its members – not just the incredibly wealthy. It would be better if we spent money on housing, education, health and public transport than tax breaks for the rich and their corporate entities. We could have had a much more vibrant local economy if we had chosen to develop renewable energy sources – which are abundant and relatively benign in their impacts – than LNG. Far better to have built fast LRT and slow streetcars, with lots more regional rails than freeways. Not taking money from people as MSP contributions, higher ICBC premiums, BC Hydro bills and BC Ferry fares but increased income tax on the top brackets. Less emphasis on profitable high rise condo towers, much more for co-ops, housing societies, even outright public housing. Not developing the University Endowment Lands for private profit and occupation but for student accommodation. Not building the real boondoggles – the convention centre, BC Place, the casinos but putting that money to work where it is is actually needed for local welfare – which includes mobility for all, not just those who can afford a new car. We do not live in such a country. Our province has long abandoned such approaches no matter what it claims. The best we can do is make the adjustments that we can. And a half a cent on the sales tax – provided other levels of government match the funds – is at least a step in the right direction. The people who oppose it have (so far) failed to come up with anything better. I went out this morning to the new Anvil Centre in New Westminster. The Mayors’ Council held a public meeting to approve the referendum question which is based on a proposed 0.5% addition to Provincial Sales Tax levied in Greater Vancouver. The link takes you to all the material discussed at that meeting and for a very good summary, as well as copies of the distributed materials I recommend Jeff Nagel’s report in the Surrey Leader. Only three of the Mayors dissented but then they can do that safe in the knowledge that the referendum process will proceed, and if the question passes their communities will still benefit. So they get to do a bit of grandstanding. Mayor Corrigan of Burnaby boasted about how much more he knew about transit than anyone else having been in charge of BC Transit at the end of the nineties – when it won awards as best transit system. 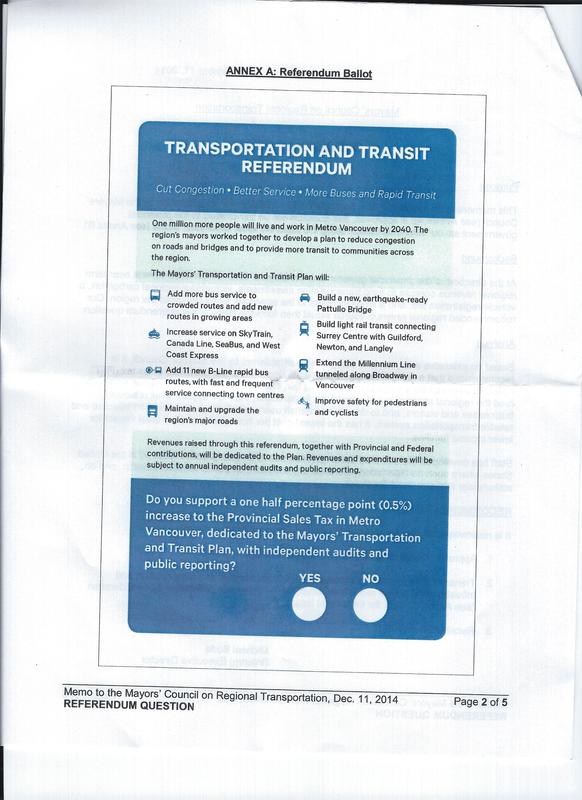 You may recall that was the contest where BC Transit nominated itself and there was no other system nominated. You may also recall his discomfiture at the revelation that he himself did not actually use the system but was happy to drive himself around in a leased Saab paid for by the system. West Vancouver Mayor Michael Smith seemed most offended by Translink’s decision to set aside $4.5m to “lobby on the referendum”. “Are they a transportation company or a political lobby group?” he asked rhetorically. Of course since the referendum is about Translink it would be even stranger if they made no attempt at all to communicate with the people who are being asked to vote on a tax increase. And even then he had to admit that the problems really lie with the governance of Translink, which has to report to the province, the professional board, the Mayors’ Council and the transit commissioner. “No one is really accountable” he said. Translink is “high cost model” and the “strong winds of private sector should blow through the organisation.” He was most upset about the free passes given to staff, their families and pensioners. He claimed that no private sector company gives discounts to their staff. (Really? Doesn’t he know anyone who works for an airline? Does he know what the marginal cost of an empty seat on a bus is?) I was surprised he did not mention the “gourmet coffee”. I found a bit more sympathy with the new Mayor of Maple Ridge who opposed the motion on the basis that the Mayors will have no say at all on how the money is going to be spent. Actually, if you look at the question itself you will see the other Mayors had this covered by insisting on independent audits. Lois Jackson managed to work in a sly dig at the amount of work the new Mayors must have had to do to get up to speed on the proposal. She was all in favour of it, the combined Mayors of South of the Fraser having got all they wanted into the proposals. 20% of the population currently lives within walking distance of the Frequent Transit Network. Once this plan is implemented that will increase to 53%, she said. The figures for distance to jobs are even better: from 31% now to 67%. (All these figures are direct quotes from her second speech which came just before the vote). Ian Black CEO of the Board of Trade spoke to the Mayors before their debate started on behalf of the new coalition which has been formed to promote the Yes side of the campaign. His case seems to be that people will vote for better transit if you add the words “transportation” and talk about how congestion increases business costs. As usual Translink came in for a lot of criticism about its lack of accountability (as though that were their fault) and their apparent reckless spending. No one mentioned the many audits, consultants reports and comparative studies that have been done over the last few years most of which came from independent sources, usually highly paid accountants, all of which found that Translink performs as least as well and in some cases much better than transit systems of similar size across North America. If this referendum does turn into a Translink popularity contest then I hope at least some of the money set aside for communications goes into wider distribution and publicisation of those studies. Not least from the province, who created the current professional board – well represented at today’s meeting, none of whom said a word – mainly due to the dismissal of the municipal representatives’ apparent inability to control spending. I have pages of notes from the meeting but no time to transcribe them now, due to other commitments. But I will be looking out for other links in the media and blogosphere – Nathan Pachel was sitting near me as was Eric Doherty. Was there any live tweeting going on at the time? I saw this story on the CBC News last night so that’s where I am linking to. It gets picked up by the paywalled press too, of course, but what I think is interesting about this version is the commentary from Eric Denhoff President and CEO of the Canadian Hydrogen and Fuel Cell Association.. While these buses may have saved some greenhouse gas emissions, the admission that the hydrogen had to be trucked from Quebec offsets that a bit. Hydrogen is of course freely available everywhere: extracting it, packing and shipping it is, of course the expensive bit, and itself consumes lots of energy. And the trucks which drove back and forth across the continent were diesel powered. There is also a plant in North Van which vents hydrogen it produces as a byproduct which is not clean enough for the finicky fuel cells. What annoys me about the web version of this story is that is misses the correct attribution of responsibility. 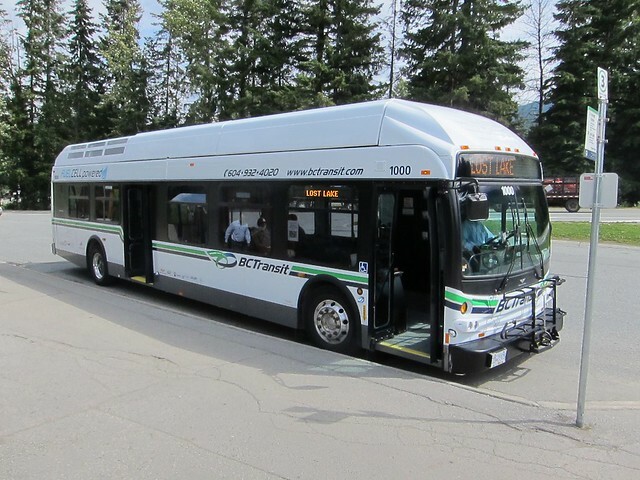 The TV news had quite a bit about the decision by Gordon Campbell to buy these buses and have them run in Whistler during the Olympics. It also mentioned the complete failure of the “hydrogen highway” that he announced with Arnold Schwarzenegger that never materialized. The Province always has money for these ribbon cutting, PR fluff type projects. Obviously just not enough money for Whistler’s transit system to keep running the things. There is never enough money to run transit in BC but every so often they go all loopy and buy a bunch of white elephants. Several different iterations of CNG buses wished on to Vancouver before they got one that actually worked reliably. Even though the emissions from diesel buses fitted with mandatory control equipment now equal the tailpipe performance of CNG. Not that there is much wrong with air quality in Vancouver. 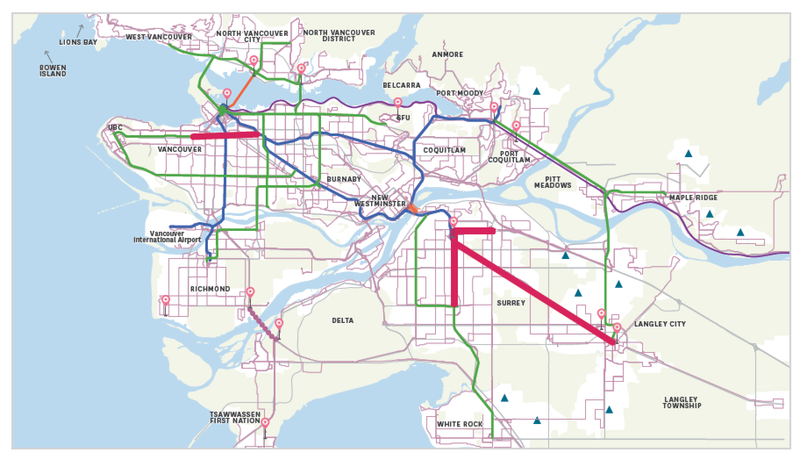 It is also worth noting that the CBC web version mentions that there is a Plan B if BC Transit can’t find a buyer, which I would think is the most likely outcome. He has sat on the Mayor’s proposal for months. He insisted that they come up with a costed plan – and they did. But he has waited until now to object to the proposed provincial contribution. So why is it unaffordable? Is it because the province has been giving away far too much potential revenue to the oil and gas industry? Or is it an acknowledgement that their much touted LNG bonanza now seems increasingly unlikely? Or was it simply that they did not take into account the revenue shortfall of the Port Mann toll? Does that mean the replacement for the Massey Tunnel has become unaffordable too? Or that the second bridge for the Premier’s constituency has been cancelled? No. Of course I am joking about the last two. Those projects are unassailable. So how exactly are the Mayor’s supposed to make plans for the future? If they do make the – very unlikely – choice to once again increase property taxes to make up for the shortfall in provincial contributions , what’s to stop Stone from deciding that he does not actually have to come up with any money for transit at all? Of course, if the Mayors want money for road projects, or to stuff more cash into the P3 money pit, I suppose that will be quite acceptable. As though there was something magical about the previous periods. The Province of BC has systematically starved transit – not just in the Lower Mainland but in the rest of the province too – for as long as records have been kept. The Metro Vancouver region has been growing rapidly, is absolutely critical to the provincial GDP but has never had enough support to extend transit into the most rapidly growing areas. The result of lack of transit spending, combined with continued highway expansion, has been increased car dependence. And as a result higher healthcare costs, damage to the environment, loss of productive agricultural land and green space. All things the provincially approved Regional Growth Strategy was seeking to avoid. But there is now a wider Highway #1, the South Fraser Perimeter Road, the widest bridge on earth (she says) and an improved Sea to Sky Highway. And a little tiny subway built down to a price not only inadequate to carry existing loads comfortably but apparently impossible to put all of its 20 two car trains into service due to the ruinous P3 arrangement. Well, if you renege on your part of the funding bargain, or the referendum fails all that becomes academic. The election of a new Mayor in Surrey who has already declared she can deliver LRT even if the referendum fails shows how easily the present unity of the Mayors can fall apart. I am not sure that that is not the intention. The Province – no matter which party was in power – has always preferred to dictate where major rapid transit projects will go and what technology they will use. The Millennium Line, Canada Line and Evergreen Line all reflect control from Victoria. 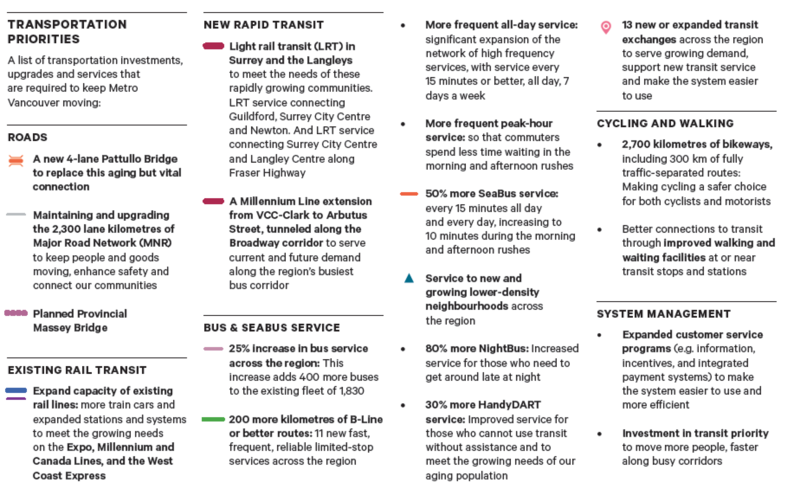 Translink has to make the best of them it can, but they leave much of the region underserved by good quality transit. There was supposed to have been increased transportation choice ever since the LRSP was adopted, but for most of the region it has not happened. The choice is to drive or get someone to drive you, unless you are willing to wait for slow, unreliable and infrequent bus service. Only the #555 shows any real improvement South of the Fraser – and even then they left out the bus stop for Surrey. And there is still no direct bus service between Coquitlam and Surrey centres because that would impact the indirect two transfer SkyTrain option that the Evergreen Line will eventually provide. But the amounts made available to transit pale in comparison to the amounts devoted to continuing highway expansion. No-one ever gets to vote on those proposals. Who would like a referendum on LNG?